Most of a bag of Garofalo pasta (calamarata), the end of a bag of lentils, about 1/4 cup of wheat berries, 1/3 bag of cornmeal, some vinegar, a little sugar, too many rolled oats, and half a bag of cocoa nibs. That’s what my pantry looks like right now, and as much as possible must go before the end of the week, when I move out for the summer. I enjoy the task of finishing the few things I have left. There is something satisfying about consuming the little ends of things that have accumulated during the year, watching the pantry get a little emptier each time. Finishing the pantry items is also fun because it forces me to get creative. 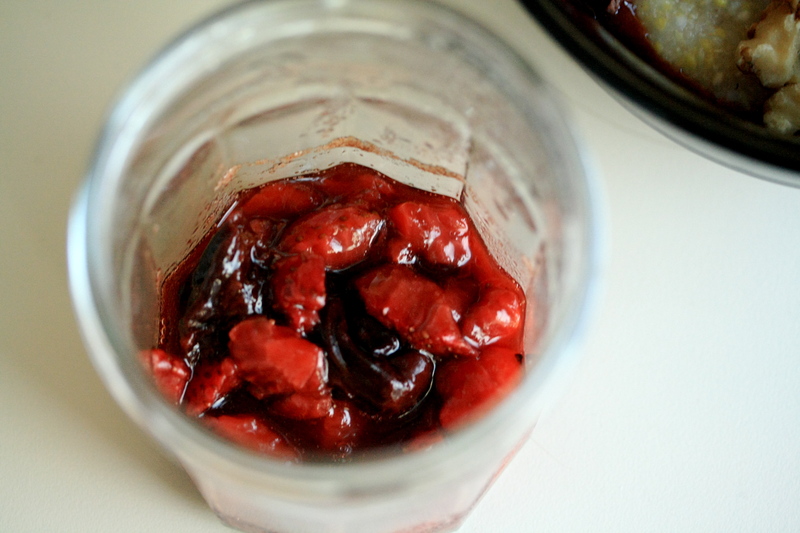 I noticed that I had a tiny bit of balsamic vinegar left, so I decided to combine it with the three strawberries that remained in my fridge to make a nice sweet and sour topping for some of that cornmeal sitting in my pantry. 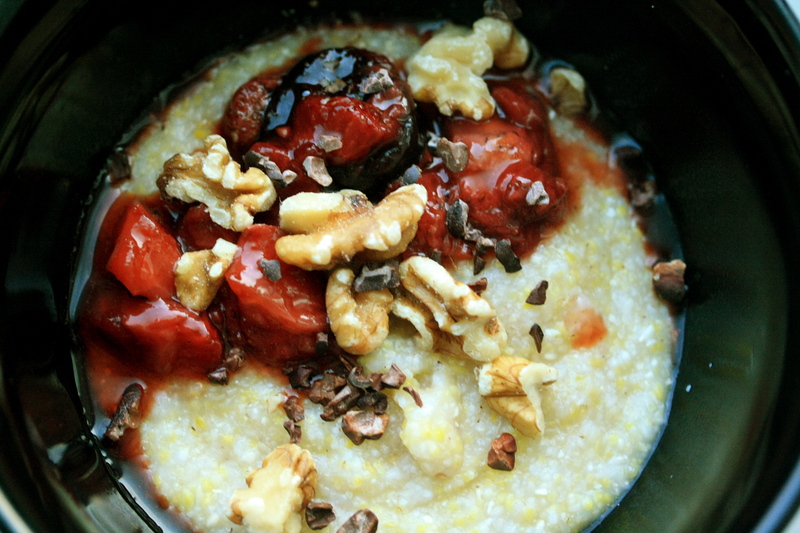 I’ve lately begun to expand my breakfast grains to include things that aren’t oatmeal, like buckwheat groats, brown rice, and especially, cornmeal. For some reason, the idea of polenta for breakfast intrigues me, although it’s is really not all that different from grits. In fact, sometimes it’s the same thing, just sold under a different name. The difference between polenta and grits is that grits are made from hominy, which is corn that has been treated with an alkaline solution, while polenta refers to pure cornmeal. In reality, polenta had existed in Italy long before the arrival of corn, and it referred to any porridge of ground grains. But what I am really interested in is the idea of eating sweet cornmeal mush…exciting, right? 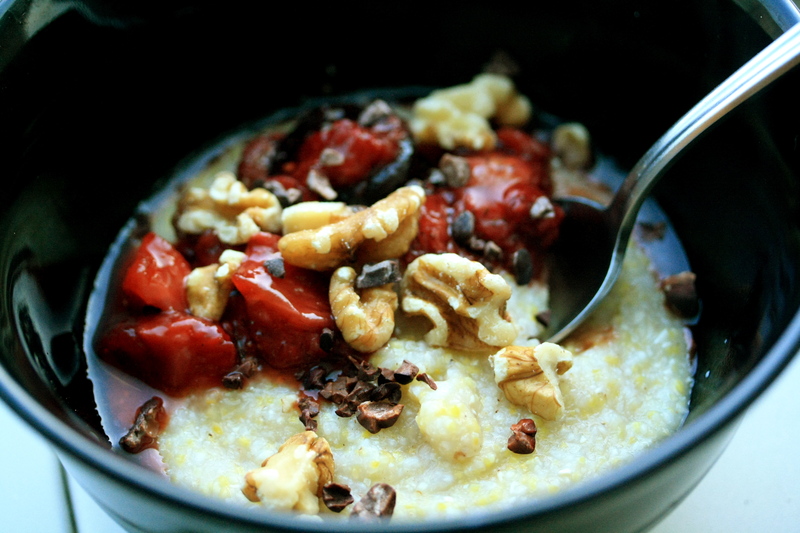 Usually, grits and polenta are served as savory dishes, but there is no reason they can’t be sweet. Like rolled oats, cornmeal can act like a blank canvas, and its distinct “corniness” is a really fun flavor to play off of. 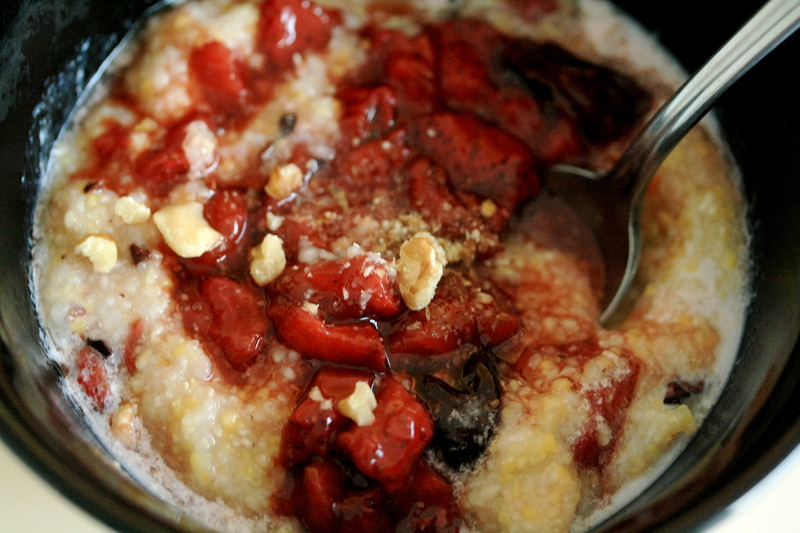 Here is one way you can enjoy your morning cornmeal mush and feel gourmet about it. The balsamic vinegar’s savory notes play well with its classic sweet partner, the strawberry, against the mild corny backdrop. Feel free to adjust sugar levels to fit your tastes, especially because this recipe is pretty loose. I just kind of chucked it all in a pot and hoped for the best. Prepare the balsamic strawberries: In a small saucepan, add the chopped strawberries, prunes, vinegar, and sugar, and cook until the strawberries have begin to dissolve and their juices thicken. Turn off the heat and set aside. Bring 1/2 cup water to a boil and pour in the cornmeal. Cook until all the water had been absorbed, adding more if it looks like it needs to cook a little longer. 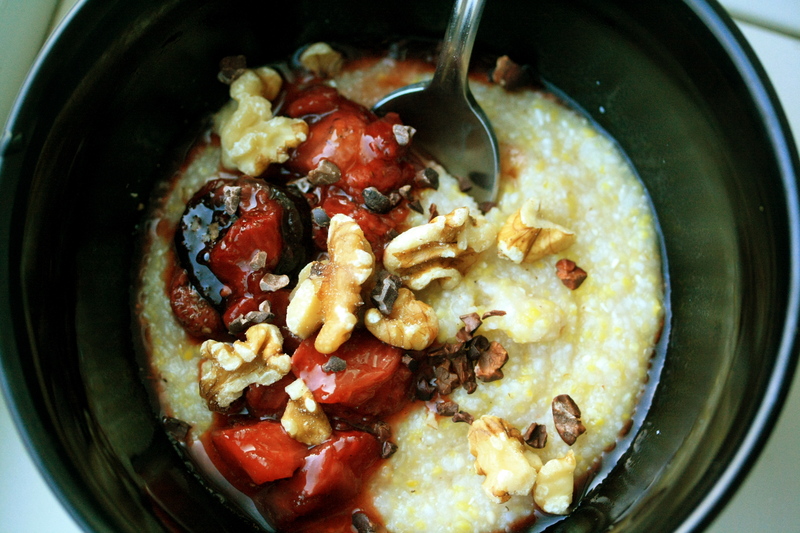 Pour the polenta into a bowl and top with the strawberries, adding walnuts and cocoa nibs if you want some crunch, and a little pour of milk if you like it a little soupy.